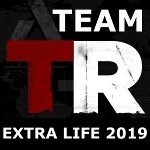 We're a group of Tomb Raider fans on a mission to help sick and injured kids. You've heard of fund-raising marathons, walk-a-thons, fun runs, and such. We're doing the same thing only with video games, and we need your help! The first weekend in November we'll be joining thousands of other Extra Life players for a gaming marathon to benefit Children's Miracle Network Hospitals. As the event gets closer, we'll be posting info about our Tomb Raider marathon and prize raffle, so watch this space! Individual team members will also be playing on other days throughout the year, so please check the ROSTER for details. When you donate through one of our team members, 100% of your tax-deductible contribution goes directly to the children's hospital that team member supports. Donating online is safe and easy. Click the "Roster" link above and choose a team member. Then just follow the instructions on that player's page to make a secure online contribution. To donate cash, check, or money order, please contact any team member for details. Even if you can't make a donation, you can still support the team by joining our livestreams and spreading the word. If you're a gamer, we'd love to have you on our team! Check out the Tomb Raider Community Extra Life FAQ then click "Join Our Team" above. For more information visit the Extra Life and Children's Miracle Network Hospitals home pages, and feel free to contact Stella, our team captain.